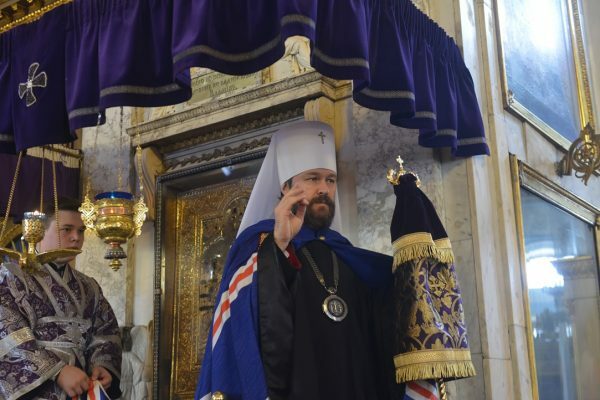 On March 31, 2019, the 3d week of the Great Lent, the Sunday of the Adoration of the Cross, Metropolitan Hilarion of Volokolamsk, head of the Moscow Patriarchate department for external church relations (DECR), celebrated the Divine Liturgy of St. Basil the Great at the Moscow church of Our Lady the Joy to All the Afflicted-in-Bolshaya-Ordynka. The day marked the 10th anniversary since Metropolitan Hilarion was appointed as head of the DECR. The archpastor was assisted by Metropolitan Niphon of Philippople, representative of the Patriarch of Antioch and All the East; Bishop Dionisiy of Voskresensk, first deputy chancellor of the Moscow Patriarchate; Archpriest Nikolay Balashov and Archimandrite Philaret (Bulekov), DECR vice-chairmen; Archimandrite Seraphim (Shemaytovsky), representative of the Orthodox Church of the Czech Lands of Slovakia; Hegumen Arseny (Sokolov), representative of the Patriarch of Moscow to the Patriarch of Antioch; and other church officials and staff members of the DECR in holy orders. After the Prayer of Fervent Supplication, His Eminence Hilarion lifted up a prayer for peace in Ukraine. After the service, the worshippers venerated the cross taken out to the center of the church. Then Metropolitan Niphon made a speech on behalf of the representatives of Local Orthodox Churches to the Moscow Patriarchal see. He said that Metropolitan Hilarion inherited from his outstanding predecessors a serious and strong department, which he managed skillfully. ‘Under your guidance, your competent team well-versed in not only Orthodoxy but also other confessions and religions really help to form strong human relations in the world so necessary in our difficult time of mutual alienation’. Praising Metropolitan Hilarion’s merits as a highly educated leader and composer, he also thanked his mother for giving him an excellent education including a musical one. He also commended Metropolitan Hilarion’s sermons as genuine peaching of Christianity and Orthodoxy and enhancement of the authority of the Russian Church. Archimandrite Seraphim read out a congratulatory message from His Beatitude Rostislav, Metropolitan of the Czech Lands of Slovakia, pointing out in particular that at a time of great changes in international relation, ‘we give a great value to your efforts not only to preserve but also strengthen the church unity, relying on the solid foundation of Orthodox doctrine and canon law’. Then Metropolitan Hilarion delivered an archpastoral homily, in which he spoke first on the theme of the day, the Adoration of the Cross, saying in particular, ‘We are those for whom Christ made His redemptive sacrifice on the cross…, and we should remember what a great price was payed for each of us and for our salvation’. He also thanked Patriarch Kirill ‘for confidence in me shown 10 years ago and through these years’. Speaking about the external relations of the Russian Orthodox Church, His Eminence said: ‘We went through a period of well-being and prosperity, many achievements and gains. But the period of welfare has been replaced by trials through which we are going today together with all the Local Orthodox Churches. And we hold very dear the support of the Local Orthodox Churches, which we can feel in everything we are doing. We are not struggling for any personal or particular interests; we are standing up for the canonical ecclesial truth, defending it with all the humbleness and trust in the mercy of God. ‘For me as head of the Department for External Church Relations, it is especially gratifying to note that the actions of the Patriarch of Constantinople, which were aimed personally against His Holiness Patriarch Kirill and against our Church, once a daughter of the Church of Constantinople and now a sister equal to her, have found no support from any of the Local Orthodox Churches. This support of the Local Orthodox Churches, which we can feel today, costs a good deal’. He also thanked the DECR staff ‘for the ten years of common life journey we make bearing the cross placed on us by our Lord Jesus Christ… Our department is often called ‘the ministry of foreign affairs of the Russian Church, but it would be more correct to call it today ‘the ministry of defense’ of the Russian Orthodox Church, perhaps, a frontier service, for we guard the sacred borders of our Church protecting her by all available means and ways. But our primary defender is the Lord Jesus Christ and it is by the power of the Lord’s cross that we resist the encroachments on our sacred borders, which come from various sides. We are aware that standing behind them is not the will of God and not even the human will, but the will of the devil who wishes to bring division and confusion in the family of Local Orthodox Churches, to undermine and shake our unity. But the evil one will not only fail to do it because the firm and calm stand of solidarity between the Local Orthodox Churches will not let the schism be accomplished and deepened. We believe that with God’s help all these temptations will be overcome’.